If you’re a fan of our area’s great estates and historic country houses, it is likely that you’ve had such a vision. Those homes are often restored and renovated, but rarely is there an opportunity to live in a brand-new house on one of those East Lake Forest Historic District properties. After two years of careful planning and research, Patricia Knapp and Lakeshore Development Partners has unveiled the 21st century version of the quintessential Lake Forest country house. Built on a plot of land adjacent to a historic James Gambel Rogers mansion, the sprawling French Chateau-inspired home at 980 East Illinois Road is filled with luxury finishes and attention paid to every detail. “When we started the project we wanted to do something that fit the character of the street and East Lake Forest and paid attention to all the architectural details of the area,” explains Knapp, who worked on the project with her father, John Domanus, and architect Scott Streightiff. Lakeshore Development also commissioned an interior architect from Paris (a family friend) with ties to famed design firm, Alberto Pinto, to design the entry door, foyer paneling with concealed closets, and dining room ceiling detail. “We value intricate historic details, but we also focus on the conveniences of today and the way people live,” Knapp adds. This means that in addition to a stately slate roof and copper finishes, the home is wired with all the high-end mechanicals and energy efficient features that older homes never had. It’s truly the best of both worlds for people who admire the elegance of historic homes but crave the convenience of modern amenities. 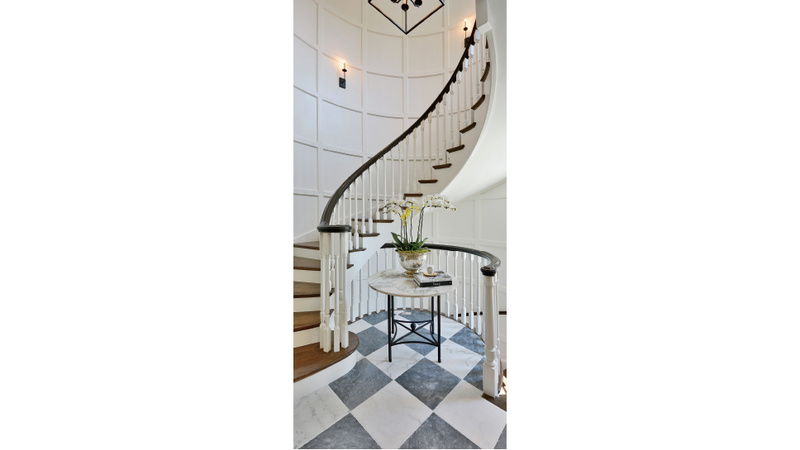 The six-bedroom, six and two half bath home includes cross vault ceilings, a curved staircase, custom millwork and cabinetry, six fireplaces, two laundry facilities, an oversized mudroom and hardwood flooring throughout. The lower level includes a kitchen/bar, wine cellar, and two fireplaces. Outdoor living extensions are perfect for entertaining—a covered loggia, a three-season porch with fireplace, two exterior terraces and a balcony off the master suite. French influences include a bluestone chip forecourt, arched French casement doors, a painted entry door with center knob, an antiqued checkerboard floor in the foyer, and mirrored pocket doors that add an element of glamour. Jean Anderson, broker for Berkshire Hathaway HomeServices/KoenigRubloff Realty Group in Lake Forest, who is currently representing the home, says the house looks like it has always been there. Knapp, who left her marketing job to start Lakeshore Development Partners with her builder father, says it was a thrill to develop the project and bring such a special property to the Lake Forest market. She has a penchant for interior design while her father has more than 25 years of experience in building luxury homes in the area. The house at 980 East Illinois Road is currently on the market for $4,999,999. For more information, contact Jean Anderson at 847-460-5412. For new construction or remodeling inquires, contact Patricia Knapp at 773-687-8087.